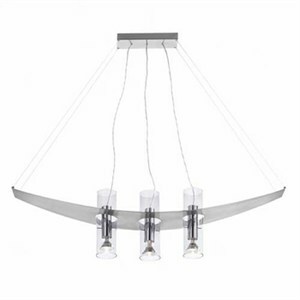 Sleek suspension design featuring a curved , stainless steel blade pierced by three transparent glass cylinders. Downward illumination is provided by Par lamps. Wall and ceiling designs are also available. A rectangular backplate attaches to a standard 4 � junction box. The curved arc is suspended with 4 cables and the three glass cylinders sit within the curved blade.